I would either be , duh, or . espeon because who wouldn't want to be a psychic cat thing, and latios because, like said before, i would be psychic, able to fly and dissaper. I'd like to jump as high as a building! I'd like to fly, and I'll burn my trainer's face! being a dragon is so convenient, fly across the sky, hyper beam-ing foes, other than that be your trainer's fave. Psy-yai-yai-yai-yai! Omigod it is so cute!! is so cute, a fave of mine. I'm loyal, just like the Gardevoir in PMD's story. she's just got that "edgy" look. even the name strikes fear into me. I am a Mudkip in my PMD red, somehow I'm attracted to it. I liek to be every Pokemon there is! P.S. 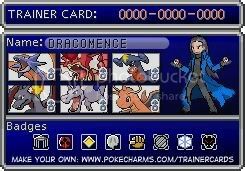 I'd just be a and change into any random Pokemon I want! For me, I definitely want to be a . It is powerful and cute. Dragons are just so cool! Well, the DragonflyCave Personality test made me a Slowpoke, but I would problably evolve myself into a for two reasons. One, I could have a better moveset, and two, I could accually TALK TO MY TRAINER (to ask for lemonade!). I'd love to be a cos he's colored my favorite color, he's just cool in the anime, he has the coolest type combination (Dragon & Psychic) in the game and is also extremely powerful. I'd also love to be an cos it can create anything it wants. is yet another Pokemon I'd love to be cos like its theme color is my favorite color, he's a dragon and it controls time...how cool is that? I would be a Ditto. Yeah, it sounds stange, but you could morph into anything you want! I'd love to be Darkrai. It's so cool! Putting Pokemon and humans to sleep. And talking English. Yeah! I'd be a so I could be a cool blue puppy thing and still understand peoples. Probably Slowking. He suits me. Probably Jolteon because it'd be nice to be fast and shock people, Uxie because knowing everything would be awesome, or Slowking because it's fitting for me. I'd like to be something that can fly, but still go in the water, so Dragonite, Gyarados, Mantine. I would either be or there both strong awsome pokemon. But my personality test said i was a so i im ok with that 2. Probably I'd like having a rival ( ) to keep me sharp. We're assuming that we'd be a Pokémon in a Mystery Dungeon-type setting, right?